We receive a call or booking for a clothes collection or fundraising event. This can either be from an organisation, individual, school or a clothing bank. 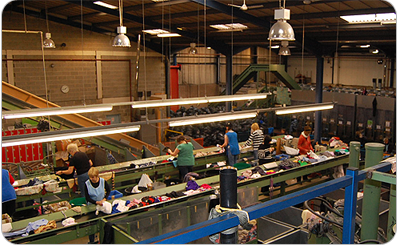 Clothes Banks are regularly monitored to ensure that donations can be received at all times and our clothes banks are maintained to the highest standards. These clothes are then loaded into our vans where the driver then weighs them and issues a docket recording the weight. In the case of fundraising events we can also make payment on the collection day where required. The clothes come back to our depot were they are checked for quality and cleanliness and then they sorted into different categories depending on what type of clothes they are. They are then stored until they are ready to be recycled and used again. The clothes which we collect are recycled and reused in a number of different ways. 66% of the clothes are exported to African countries for re use. 24% of clothes taken in are shredded down and used as a raw material known as Flock which is used in carpets, mattresses, sofas and sound proofing. 6% are sent to Pakistan for re use. 2% account for the plastic bags which the clothes come in and the final 2% goes to landfill as these are soiled clothes, odd shoes and broken toys which cannot be used again. There are many reasons to recycle your used clothing, shoes, belts, handbags and mobile phones. Not the least of which are the mountains of discarded clothes and mobiles that end up in Irish landfills each and every year. Did you know that Synthetic (man-made fibers) products will not decompose, and while woollen garments do compose, they produce Methane, which contributes to global warming and other environmental problems. When clothing isn’t recycled, it means more and more has to be produced and that means more and more pollution for all of us. Our fleet is run from our head office in Kildare where our drivers make daily collections from our Textile banks that are situated nationwide. All our textiles are then taken to a purpose built factory where they are manually sorted in to specific materials, colours and quality. The clothes are then graded and baled and distributed to a wide range of national and overseas markets. Once these clothes reach these oversea markets they are then sold at markets at affordable prices. For those clothes that cannot be reused they are then shredded down in to raw material (known as flock), which are used for a wide range of purposes such as carpets, mattresses, sofas and soundproofing. Over 70 per cent of the world's population use second-hand clothes. Good quality clothes are sold at very low prices in markets in Africa, thus creating thriving businesses for African people. The second- hand clothes trade supports hundreds of thousands of livelihoods in developing countries by means of trading, distributing, repairing, and restyling the clothes. For example, in Senegal alone there are over 24,000 people working in the second-hand clothes trade. (Source: Oxfam).